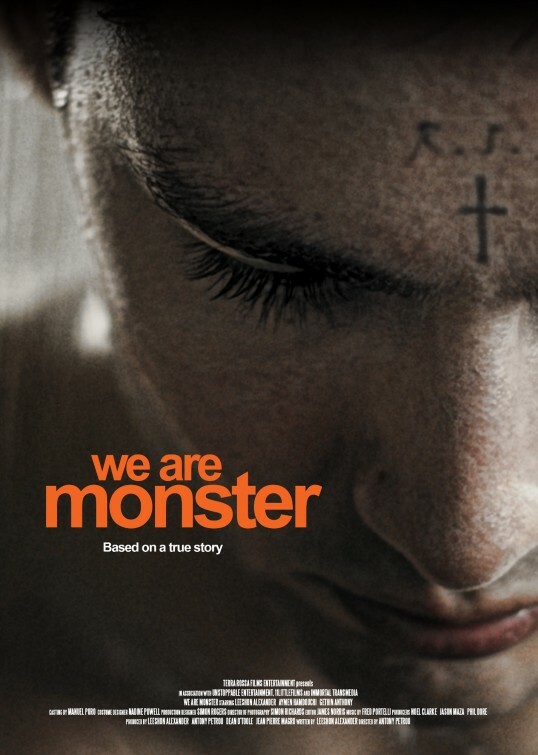 Tag line: "Based on a True Story"
Directed by Antony Petrou, We Are Monster is a 2014 dramatization of a real-life murder (and a disturbing one at that), which occurred on the morning of July 8, 2000 at the Feltham Young Offenders Institution, a London-based correctional facility. Prisoner Robert Stewart, a known racist who had exhibited violent behavior in the past, bludgeoned his Pakistani cellmate Zahid Mubarek to death with a table leg hours before Mubarek was to be set free (he had reached the end of his 90 day sentence). Mubarek’s family spent years trying to get answers from the authorities at Feltham, including why a known racist was put in the same cell as their son. Told from the point of view of Stewart, We Are Monster is, at times, an engaging motion picture, but in the end doesn’t delve as deeply into its subject matter as it should have. As the movie opens, Stewart (Leeshon Alexander, who wrote the film’s screenplay) has just arrived at Feltham, having been transferred there from another facility. A loner, Stewart spends the majority of his time talking to a manifestation of his alter-ego (also played by Alexander), recalling how, as a child, his violent father (James Hyland) would beat him for the slightest infraction; and, years later, how he and his good friend Maurice Travis (Gethin Anthony) got into all sorts of trouble. In addition to his strange behavior (several inmates catch him talking to “himself”), Stewart is hostile towards minorities, with his cellmate, Zahid Mubarek (Aymen Hamdouchi), receiving the brunt of his aggression. Spurred on by his alter ego, Stewart decides its time to put these “inferior” races in their place, resulting in a tragedy that would shake the British penal system to its core. Alexander does a remarkable job in what is essentially a dual role (both Stewart and his doppelganger), conveying the anger of a dangerous bigot who, by way of conversations with his alter ego, recounts the events that started him down the path of hatred. Even in those scenes that are dialogue heavy, the dynamic between the real Stewart and his imagined evil twin is always intriguing, and at times even fascinating (the alter ego occasionally goads Stewart, insulting him and questioning if he’s man enough to do what “must be done”). We Are Monster also features several well-realized flashback sequences, where we witness the beatings Stewart was subjected to as a child, as well as his frequent visits to the psychologist (Rob Swinton), who, try as he might, couldn’t reach his young patient in time to save him. 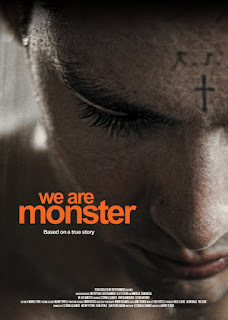 But while the flashbacks and Alexander’s performance do their part to make We Are Monster a hard-hitting experience, the movie never goes as far as it should. We see the abuse Stewart received as a child, both from his father and his mother (Jennifer Aries), and there are hints that he inherited his racist attitude from dear old dad (in one scene, his father nearly attacks his mother for speaking to a black man), but We Are Monster doesn’t spend enough time exploring these traumas, choosing instead to focus on the effect (Stewart’s hatred) as opposed to the cause. And while the murder of Zahid Mubarek was as much an indictment of the British penal system as it was a personal tragedy for his family, We Are Monster mostly ignores this aspect of the story as well. As a journey into the psyche of a dangerous sociopath, We Are Monster works well enough. But it doesn’t do much else, and this particular story deserved more than the filmmakers delivered.